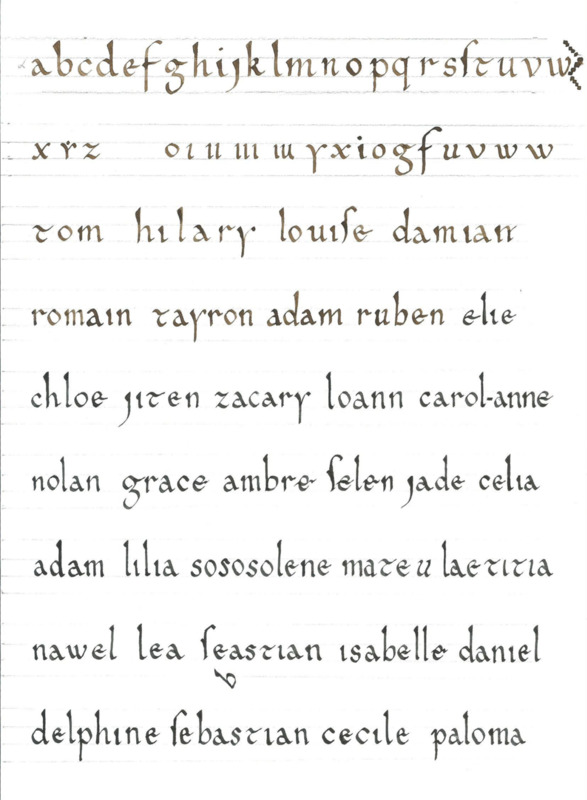 In 2011 I started teaching Medieval repertoires and interpretation from the manuscript sources in Spain, France and Italy. This activity has revealed to me the joy of sharing the music that fascinates me with both children and adults, musicians and amateurs, and allows me at each course to study in depth this repertoires' transmission. October 2018-June 2019: Third cursus of the ESCUELA DE MÚSICA MEDIEVAL Y DE TRADICIÓN ORAL in Madrid, at the Institución Libre de Enseñanza (fondation Francisco Giner de los Ríos). More information: .pdf. March 2nd-3rd 2019: “Cómo sonaban los primeros manuscritos musicales de Occidente”. A weekend course organized by the Centro de Estudios Comarcales de Bajo-Aragón-Caspe, VIIIth edition of the “Taller de Canto Coral, ciudad de Caspe”. April 6th-7th 2019: "Octoechos-Modalité médiévale et improvisation", a weekend-long course at the Centre de Musique Médiévale de Paris (France). April 8th 2019: Formation “Chants du sacré” for French teachers of classes 6-18 years-old children at the Philharmonie of Paris. April 18th-22nd 2019: “Singing and improvisation in medieval music”, a 5 days course in Cardedeu (Spain) during the Labyrinth Catalunya Musical Workshops’ spring seminars. 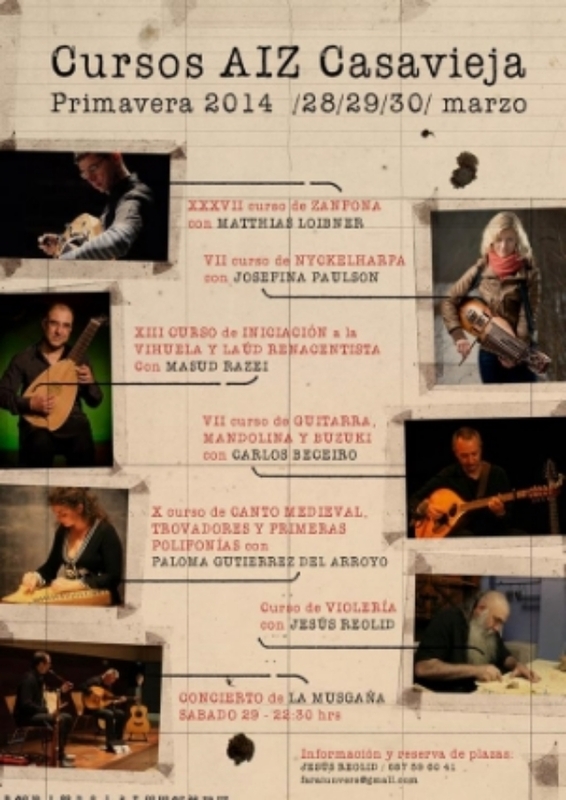 July 12th-14th 2019: “IV TALLER DE MÚSICA MEDIEVAL. LOS SONIDOS DEL ROMÁNICO. La música del Codex Calixtinus”, a 3 days course in Aguilar de Campoo (Palencia, Spain) organised by the Centro de Estudios del Románico (Fundación Santa María la Real). More information in this .pdf. July 19th-25th 2019: “Canto Gregoriano. La monodía en los siglos XIII-XIV y el fabordón como ornamentación del canto llano en el s. XV” at the summer Early Music Morella course (Castellón, Spain). November 16th 2019: Participating at the cycle “Los sonidos de otros tiempos, hoy” organised by the Escuela de Música Medieval y de Tradición Oral and the Institución Libre de Enseñanza. 13th-15th July 2018: "III TALLER DE MÚSICA MEDIEVAL. LOS SONIDOS DEL ROMÁNICO: Cantando los Carmina Burana medievales", at the Centro de Estudios del Románico (Fundación Santa María la Real) in Aguilar de Campoo (Palencia, Spain). A three days-long course for singers and amateurs of medieval music, focused on the Carmina Burana. 4th-6th July 2018: Academia de Música Antigua, Fundación Joaquín Díaz, Urueña (Valladolid, Spain). Participating at this summer academy together with the ensemble Cantaderas. 3rd-4th March 2018: one weekend singing course at the "Escuela de Música Medieval y de Tradición Oral" of Madrid: "TRADICIÓN ORAL y TRADICIÓN MANUSCRITA. Cantar un motete de Guillaume de Machaut (s. XIV)". 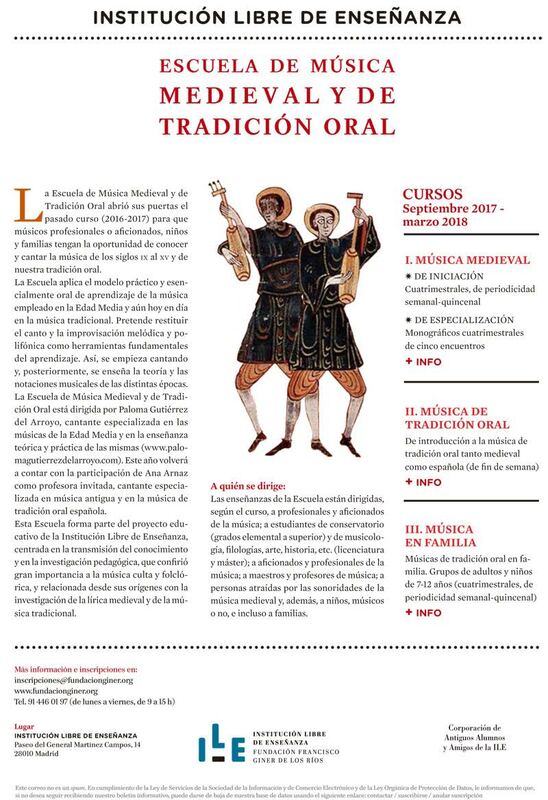 September-December 2017: Second cursus of the ESCUELA DE MÚSICA MEDIEVAL Y DE TRADICIÓN ORAL in Madrid, at the Institución Libre de Enseñanza (fondation Francisco Giner de los Ríos). More info: here in this pdf. 3rd-5th November 2017: one weekend singing course at Casavieja (Ávila). Organiser: Asociación Ibérica de la Zanfona (Jesús Reolid). Subject: Singing a XVth c. anonymous motet from the manuscript and practicing oral tradition. 17th-19th July 2017: II TALLER DE MÚSICA MEDIEVAL. LOS SONIDOS DEL ROMÁNICO: Beato de Liébana y las músicas del Apocalipsis (siglos X-XIII), Fundación Santa María la Real, Aguilar de Campoo. 22nd June-1st July 2017: "Las melodías mudas del canto mozárabe", a 6 dates workshop museum of the Biblioteca Nacional de España, both in Madrid and in Alcalá de Henares, related to its exhibition: “Fragmentos medievales: vestigios del canto hispánico". 26th May 2017: Final concert of the Escuela de Música Medieval y de Tradición Oral de Madrid. January-May 2017: First cursus of the new ESCUELA DE MÚSICA MEDIEVAL Y DE TRADICIÓN ORAL in Madrid, at the Institución Libre de Enseñanza. More info here. 2nd-3rd April 2017: "Machaut: chanter sur les sources", a two days course at the Centre de Musique Médiévale de Paris. 2nd Mars 2017: "La vie de St Louis en chanson" at Royaumont Abbey "La vie de St Louis en chansons" at the Fondation Royaumont (Île de France). 20th February-6th April 2017: "Cantar y declamar la obra del rey Sabio (y poeta)", an eight dates workshop at the museum of the Biblioteca Nacional de España, both in Madrid and in Alcalá de Henares, related to its exhibition: "El hallazgo del pasado. Alfonso El Sabio y la Estoria de España". 8th October 2016-18th January 2017: "El sonido de los siete sellos", a ten dates workshop at the museum of the Biblioteca Nacional de España, related to its exhibition: "Beato. El misterio de los siete sellos". May 2016 - January 2017. O felix Zamora. La improvisación polifónica en la Edad Media, at the Fundación Lázaro Galdiano, Madrid. A pedagogical project heading towards a concert with in-vivo improvisated polyphonies adorning the monody of an unicum manuscript conserved at the library of this Spanish foundation. Presentation concert of this project took place on January the 22nd, both at the Lázaro Galdiano Museum's auditory, and at the Sacristía Mayor of Toledo's Cathedral. 22-25 October 2016: 5th edition of the course "Le chant des monodies médiévales en langues vernaculaires romanes", at the fortified manor house of Volhac (XIVth c.), near Le-Puy-en-Velay, France. 9th-11th September 2016: Hildegard von Bingen's music course at a new and promising Music school in Cádiz: BRAVISSIMO. 24th-28th July 2016: Plain chant and its ornamentation in the Ars Antiqua at the Early Music course of Morella. 18th-20th July 2016: `LOS SONIDOS DEL ROMÁNICO´. Cantar y escribir las monodias sacras y profanas en lengua latina (siglos X-XII). An introduction workshop to the first music written in Latin at the foundation: Santa María la Real, Aguilar de Campoo. News. November 2015-June 2016. Chanter sur manuscrit les musiques du 13e siècle. A course at the Centre de Musique Médiévale de Paris. 15th-17th April 2016. "Guillaume de Machaut (II)". One weekend course for singers interested in medieval polyphony, organised by AIZ (Asociación Ibérica de la Zanfona) in Casavieja (Ávila). More info: here. December 2015-May 2016. Pedagogic projet: Fondation Royaumont-Collège de Mauriac (Île de France). Le scribe, le cantor et le jongleur au Moyen Âge. October 2015-February 2016. Second edition of the 4 sessions long course "Cantus super librum. El sonido de los manuscritos medievales" about polyphonic improvisation in the Middle Ages, organised by the Museo Lázaro Galdiano (Madrid). 20th-22nd November 2015. One weekend course at Casavieja, Ávila (Spain): "Guillaume de Machaut". Organised by AIZ (Asociación Ibérica de la Zanfona). More info: here. 19th-23rd July 2015. Gregorian chant at the 4th edition of the: Curso Internacional de Música Medieval y Renacentista de Morella (Spain). 7th-11th July 2015. Third edition of the singing course: « Le chant des premières monodies en langue vernaculaire », imparted at the Château de Volhac (Le Puy-en-Velay, France), together with Anne Delafosse. April-May 2015. Pedagogical project of the ensemble Dialogos at the Conservatoire à Rayonnement Régional de Saint-Maur (Saint-Maur-des-Fossés, France). 18th April 2015. Monodia e improvisación polifónica (fabordón) en los siglos XIV y XV. Fourth meeting of the 4 sessions long course "Cantus super librum. El sonido de los manuscritos medievales" about polyphonic improvisation in the Middle Ages, organised by the Fundación Lázaro Galdiano (Madrid). January-March 2015. Workshop on Hildegard von Bingen's music at the Conservatoire de Musique et de Danse de Montbard (Borgondy), together with Catherine Schroeder. 28th February 2015. Monodia e improvisación polifónica (organum de la escuela de Nôtre-Dame) en el siglo XIII. Third meeting of the 4 sessions long course "Cantus super librum. El sonido de los manuscritos medievales" about polyphonic improvisation in the Middle Ages, organised by the Fundación Lázaro Galdiano (Madrid). January-February 2015. "La légende de Mélusine", a pedagogical project of the ensemble Oiet at the secondary school Françoise Dolto, Lamorlaye, France. 24th January 2015. Monodia, primeras polifonías notadas e improvisación polifónica (organum y discantus). Siglos IX-XII. 2nd course of the cycle "Cantus super librum. El sonido de los manuscritos medievales" about polyphonic improvisation in the Middle Ages, organised by the Fundación Lázaro Galdiano of Madrid. 27th November 2014. "Les premières polyphonies médiévales". One day course together with Anne Delafosse at the Conservatoire National Supérieur de Musique et de Danse de Lyon. 22nd November 2014. Monodia. Notación neumática y modalidad. Siglos IX-XII. 1st course of the cycle "Cantus super librum. El sonido de los manuscritos medievales" about polyphonic improvisation in the Middle Ages, organised by the Fundación Lázaro Galdiano of Madrid. 4th-6th November 2014. Universidad Autónoma de Madrid. "Cantando el Octoechos", a three days workshop at the 1st edition of the "Semana de la Música". 31st October-2nd November 2014. One weekend course at Casavieja, Ávila (Spain): "La Escuela de Notre-Dame. Música sacra y profana en el siglo XIII". Organised by AIZ (Asociación Ibérica de la Zanfona). 12th and 22nd October 2014. « La vie de St Louis en musique ». A conference-concert at the Royaumont Abbey (Île de France). 7-11th July 2014. « Le chant des premières monodies en langue vernaculaire », a singing cours imparted at Le Puy-en-Velay (France), together with Anne Delafosse. 24th June 2014. « Être enfant au Moyen Âge » at the Fondation Royaumont (Île de France). 23rd May 2014. "La vie de St Louis en chansons" at the Fondation Royaumont (Île de France). 28-30th March 2014. One weekend course at Casavieja, Ávila (Spain): "Trovadores y primeras polifonías escritas". Organised by AIZ (Asociación Ibérica de la Zanfona). February-March 2014. Pedagogical project in collaboration with the French calligraphist Cécile Auguin, with a class of the school St-Exupéry (St Brice sous Forêt) at the Fondation Royaumont (Île de France): « musique et calligraphie au temps de Saint Louis ». 1st-2nd March 2014. One weekend course at the Conservatorio Superior de Música de Madrid: "Les deux Guillaumes. Leer y cantar Machaut y Dufay". 22-23th February 2014. Gregorian chant course from the neumatic sources organised by the choir "Caballeros gregorianos". Soria (Spain). 23rd December 2013. Musical activities with 7 to 11 years old children. "La música de los caminos medievales", at the Fundación Lázaro Galdiano, Madrid. 22nd December 2013. Musical activities for families "La tradición oral en la Edad Media: música y leyenda", at the Fundación Lázaro Galdiano, Madrid. 25-27th October 2013. One weekend course at Casavieja, Ávila (Spain). “El arte de la monodía, interpretación de la primera música escrita en la Edad Media”. Medieval Singing class inside the CURSOS AIZ CASAVIEJA. Otoño 2013. 15-18th July 2013. « Le chant des premières monodies en langue vernaculaire », given at the Puy-en-Velay (France), in collaboration with the singer Anne Delafosse. 8-14th July 2013. One week course at Cabia, in the Italian Alps, working medieval repertoires (IXth-XIVth centuries) by oral transmission and manuscript reading with the children of the “Pueri Cantores della Cappella del Duomo di Udine”, a great choir directed by Anna Giulia Serena and Francesca Marinelli. 17-19th May 2013. Master-class « Hildegard von Bingen. Du manuscrit au chant », in Cluny, Burgundy (France), organized by: Art Sacré Cluny- Pentecôte 2013- naissance d’un Festival. 15-17th Mars 2013. One weekend course at Casavieja, Ávila (Spain). “Descubriendo la música de la Edad Media. Lectura e interpretación del repertorio surgido en Europa entre los siglos IX y XV, a través de sus manuscritos” IVº curso: El ars subtilior y las polifonías de la primera mitad del siglo XV. Medieval Singing class inside the CURSOS AIZ CASAVIEJA. Primavera 2013. January-February 2013. Work with the choral classes of the Conservatoire de Vitry-sur-Seine, Île de France. 22-25th January 2013. Working at the Fondation Royaumont (Île de France) with the students of the École Théry of Gonesse, in collaboration with the ensemble Dialogos. “The legend of St Barlaam. The linguistic, musical and cultural diversity in the Middle Ages”. 19-21th October 2012. One weekend course at Casavieja, Ávila (Spain). “Descubriendo la música de la Edad Media. Lectura e interpretación del repertorio surgido en Europa entre los siglos IX y XV, a través de sus manuscritos” IIIer curso: Música francesa del S. XIV. Medieval Singing class inside the CURSOS AIZ CASAVIEJA. Otoño 2012. 20-22th April 2012. One weekend course at Casavieja, Ávila (Spain). “Descubriendo la música de la Edad Media. Lectura e interpretación del repertorio surgido en Europa entre los siglos IX y XV, a través de sus manuscritos” IIº curso: La notación modal. s. XII-XIII. La notación mensural. s. XIII-XIV. Medieval Singing class inside the CURSOS AIZ CASAVIEJA. Primavera 2012. 18-20th November 2011. One weekend course at Casavieja, Ávila (Spain). “Descubriendo la música de la Edad Media. Lectura e interpretación del repertorio surgido en Europa entre los siglos IX y XV, a través de sus manuscritos” Iº curso: Notación neumática y modalidad medieval. s. IX-XII. Medieval Singing class inside the CURSOS AIZ CASAVIEJA. Otoño 2011.